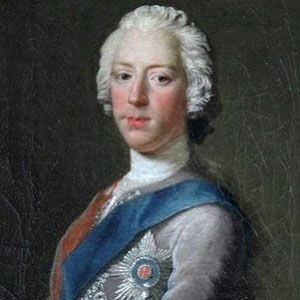 Also known as "Bonnie Prince Charlie" and "The Young Pretender," this eighteenth-century claimant to the English, Irish, and Scottish thrones led the failed Jacobite uprising of 1745. In the early 1740s, after being given the title of Prince Regent, he quickly secured French military support for his planned rebellion. His legendary retreat from the disastrous Jacobite Uprising is the subject of the folk songs "Mo Ghile Mear" and "The Skye Boat Song." The son of Prince James and the grandson of the deposed regent James II of England, Charles Edward Stuart spent his youth in Rome and Bologna, Italy. He was married to Louise of Stolberg-Gedern, and he had an illegitimate daughter -- Charlotte Stuart, Duchess of Albany -- through his relationship with Clementina Walkinshaw. He is portrayed by British actor David Niven in the 1948 historical feature Bonnie Prince Charlie.